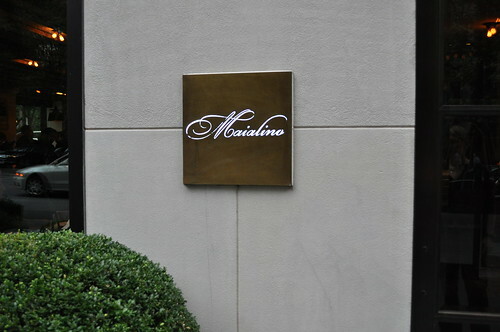 After the Giada book signing, Linda and I headed over to Danny Meyer's relatively new trattoria (opened late last year), Maialino, for dinner. Linda had told me that it'd be impossible to get reservations, so our best best was to dine and drink at the bar. She has really good taste, especially when it comes to dining out, so I trust her judgment entirely. 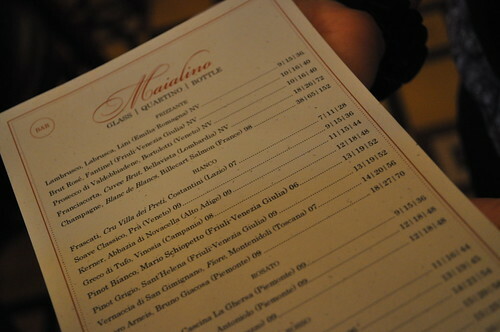 It was around 6:30 when we arrived at Gramercy Park Hotel (where Maialino is housed), and the bar was pretty happening. Most of the seats at the bar were taken, minus the few empty single seats in between couples. Luckily, Linda and her husband are regulars at Maialino's bar and have gotten to know the bartenders (they're on a first name basis with her! ), so they put us next on the list to be seated at the bar. In the mean time, we perused the bar menu for something to have while we wait and chat. I usually order wine, but the cocktails looked too delicious not to try. I asked Linda what she recommended. She recommended La Pernice. I couldn't decide which one I wanted most, so I went with that. 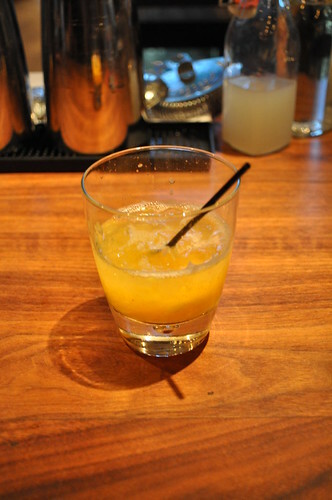 La Pernice is a muddled cocktail (bevande, on the menu), concocted with peach, Dimmi, and lemon. Lovely, delicious, and a well-balanced alcohol-juice ratio. I definitely want to go back and order another one before the season's over. Linda refers to La Pernice as "summer in a glass"--i.e., if summer were to be captured in a drink or cocktail, this would be it. One of the nights that she was here with her husband, one of the bartenders they know was off that night. He was dining at the bar next to them, with La Pernice as his cocktail of choice, when he said to them, "This is summer in a glass!" Guess he and Linda are on the same wavelength with cocktails, because it really is a glass of summer! I liked how the menu is formatted. They kept it somewhat authentic--it's always so cool when they keep the dish name in its native language (Italian here, of course), with subtle descriptions in English without ruining the poetics. 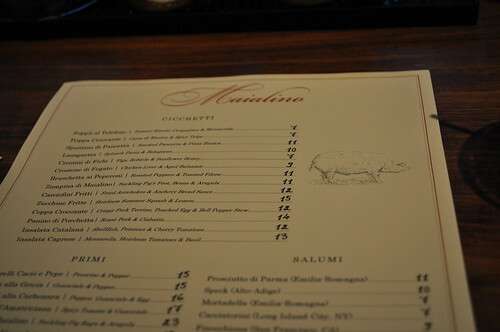 Maialino is Italian for "little pig"--which explains why there's an illustration of a pig right there. View of the bar from where we were sitting. What a beautiful space Danny Meyer selected! I was saying to Linda how rare it is to have a restaurant located on the corner of a block where they utilize the windows and natural light so well. The noise level in the bar area wasn't overwhelmingly loud, either. I didn't feel like I needed to scream in order for Linda or the bartenders to hear me. It seems to me a lot of restaurants don't take into account the sound acoustics and engineering when they're building or redoing a space for a restaurant. People come to restaurants to socialize, so you would think it's a priority concern that will surely enhance any and all experiences of the said restaurant's patrons. 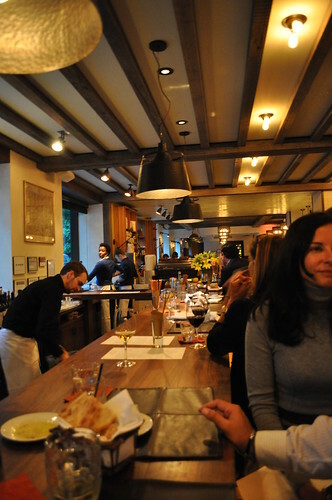 Danny Meyer tailored the space very well to accommodate Maialino's bar patrons, for sure! We started our meal with two appetizers, or cicchetti, per the heading on the menu, which are small snacks or side dishes. 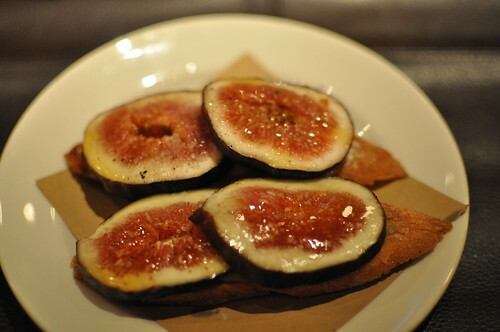 The first cicchetto was the crostini di fichi--crostini topped with figs, Robiola cheese, and sunflower honey. I usually stay away from ordering dishes with cheeses I'm not familiar with, but I felt adventurous that night. I'm glad I did so, too, because this was probably my favorite dish of the night. Usually with crostini, it's hard to keep the toasted bread slice crisp and in tact, especially when you have so a few ingredients spread on top. Maialino didn't compromise the crispiness and lightness of the crostini at all here. The three ingredients fused so well together--it was like a major-keyed symphony playing in my mouth, where it sounded perfectly melodious together while being able to hear the individual instrumental parts. The crostini was a culinary synedoche--the sum of its parts (i.e., the ingredients) totally enhanced the taste experienced from each individual ingredient alone. I can still taste the honey on my lips, the fig seeds against my teeth, and the Robiola savored on my tongue. Mmm! 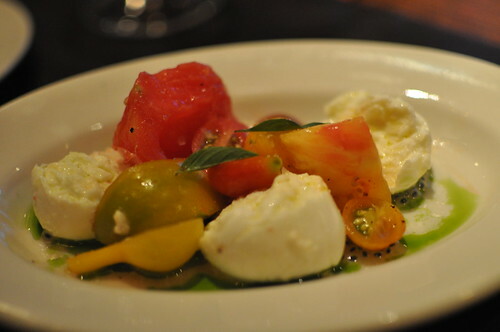 The second cicchetto we ordered was the insalata caprese, the token mozzarella, heirloom tomato, and basil appetizer. Linda kept insisting she doesn't normally order the typical items found on an Italian appetizer menu, especially the "caprese salad" seen above. However, the bartender had recommended it to her during one of her previous visits, and she said the mozzarella is so creamy and the heirloom tomatoes, locally grown, were sweet and complimented the dish very well. I don't usually mind ordering those items at an Italian restaurant, so I had no qualms with trying it! I do have to point something out though. Talking with Linda about "token dishes" reminded me of an article I read on New York magazine's website last December surrounding William Poundstone's new book, Priceless: The Myth of Fair Value (and How to Take Advantage of It). The article discussed an interesting excerpt from his book about menu design and how marketing comes into play. The one discussed item I distinctly remember was called menu siberia, "where low-margin dishes that the regulars like end up"--which is exactly where the insalata caprese was located (see fourth photo from the beginning of this entry), at the bottom of the cichetti section. Too funny. Anyway, back to the cicchetto at hand. The mozzarella was indeed the perfect consistency. Creamy, but not too much where it would've tasted milky. I also liked that it wasn't the typical "slice" from a "larger ball" of mozzarella with the same sliced tomatoes you'd find atop a cheeseburger. The asymmetry of the mozzarella pieces, along with the wedge-cut tomatoes, gave it an even more homemade feel to them. The acidity of the heirloom tomatoes gave it the right kick, making it an unexpected surprise for what we'd usually consider as "menu-siberian" dish. Maialino nailed it in execution. 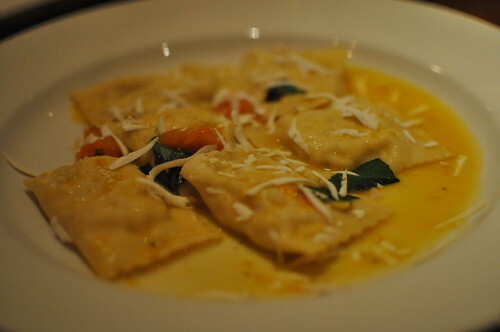 Linda's primi entrée was the agnolotti, ravioli with fresh sweet corn, cherry tomato, and ricotta salata. The ricotta wasn't overpowering, which what I usually dislike about ravioli, but I really enjoyed the small piece I sampled from here. You can also tell the pasta was made in house, which is always a nice treat, and I liked how they incorporated the sweet corn, setting this apart from any ravioli I've ever tasted. The sweet and salty tastes from the corn and ricotta had really lovely flavor interplay. I ordered the fettuccine alle cozze e gamberetti, a fettuccine dish with mussels and shrimp (I forgot to note what other ingredients were included--will have to make note of it during my next visit!). I LOVE mussels, and I love having seafood with my pasta (mostly because it isn't too filling). It was pretty good (Linda has had this dish before and said something similar), but nothing as exciting as the dishes I described earlier. 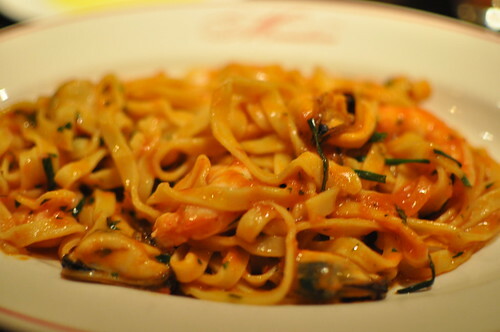 I did enjoy the freshly made fettuccine though, and the seafood was cooked well. 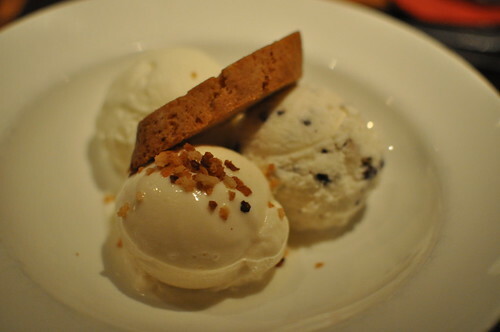 For dolci, I ordered three scoops of gelati e biscotti (clockwise, from top left): fior di latte (an Italian take on vanilla), toasted almond chip, and cinnamon toast, topped with an almond biscotti. All three flavors were amazing--very original flavors. We had the fior de latte with the crostata (see below). The toasted almond chip had these little bits of crunch to it and that refreshing almond flavor flowing throughout. The cinnamon toast may has well be named cinnamon toast crunch because it was basically Cinnamon Toast Crunch cereal in gelato form. The extra bits of "crunch" reinforces my claim. Gelati is highly recommended here! 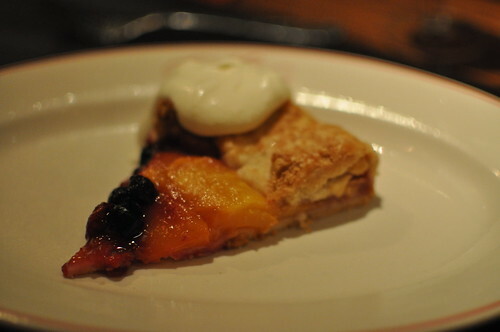 Linda ordered the crostata (I forgot to note down the actual name--will need to take photos of future menu in case entire menus aren't available online), which had peaches, raspberries, and blueberries, topped with a vanilla mascarpone. Linda recommended having a bite of this with a scoop of fior di latte (Italian vanilla gelato), and boy, was it good. Simple, fresh flavors is sometimes all you need for a satisfying dessert! Linda has made this from scratch and claims hers is better than this (I totally believe her), so I'll need to ask her to make it again! 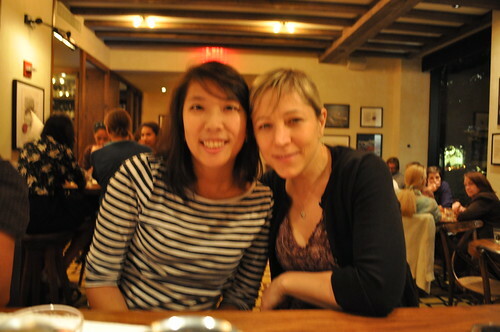 Me and Linda at the bar at Maialino for our first dinner date (nine months later)! More adventures to follow, for sure! Findings: Great for catching up on a girlfriends' night out (as Linda and I needed desperately to catch up)--we spent about 4 hours eating and laughing! The cicchetti, as you can see from the two we've ordered, were really good, so sharing a few of those at the bar with friends is great here. The bartenders are so down-to-earth and make a mean cocktail like La Pernice. And of course, dessert is a must! There's a dessert counter in the middle of the restaurant, displaying the pastry on the menu that day, so that's worth checking out as well. I definitely foresee a return visit very soon! Thanks for a lovely evening, Linda!